At Myspace a site was created by Darren Price. You can listen to some nice recordings there too. Underworldlive.com archive has been updated again today. chino_is_nagano1125 mailed me that NTT DoCoMo in Japan released a new mobile phone, the "FOMA P703iμ". Tomato made some content for it as you can see here. Another FOMA phone of the 703-series has been introduced by NTT DoCoMo – the P703iμ by Panasonic. Like the N703iμ it is the slimmest W-CDMA clamshell phone (11.4 mm). The filling of the P703iμ (screen savers, melodies, menu design) was designed by the London designer’s group TOMATO. 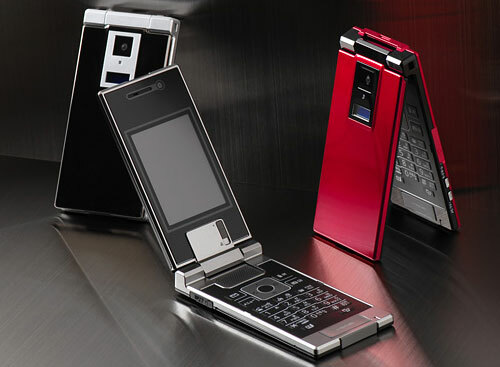 The shell is made of stainless steel, so the phone looks luxurious. Underworld vs. Abel Ramos, Slippy Electro Fun by Justin Flower a.k.a » FlowerMash-Up of Born Slippy by Underworld and Electro Fun by Abel Ramos. Damian Reds mixed Rez with TDR's Smoked Out. You can listen to it at his mypace page. This mix here by Mr MU$IC contains a Michael Jackson vs Underworld mash-up called Slippy Jean. Cow Tse Tung Sound System made another mashup with an Underworld song in it. You can listen to it here in a podcast. DaddyAdv at dirty/board found a video about the ARP2600 synth with Rick in it. This was a part of theMartin Newcombe's Museum of Synthesizer Technology video you can order here. Thnx dave for the info. Music review about Like a Stuntman. A game for the DS with a caracter called Karl Hyde. There is news that Underworld will play at Road fest in Serbia in June. Not confirmed by UW themselfs yet. Update: There are NO set dates for now, but they're looking into planning a world tour.